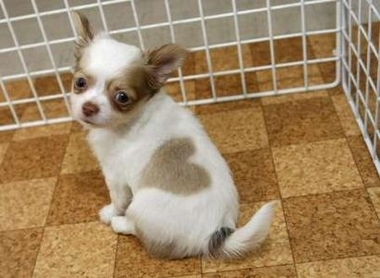 A male long-coated chihuahua named "Heart-kun" with a heart-shaped pattern on his coat sits at Pucchin Dog's shop in Odate, northern Japan July 10, 2007. 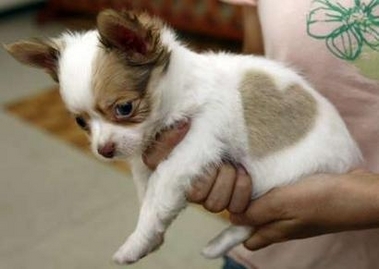 The one-and-a-half-month-old chihuahua was born on May 18, 2007 as one of a litter. 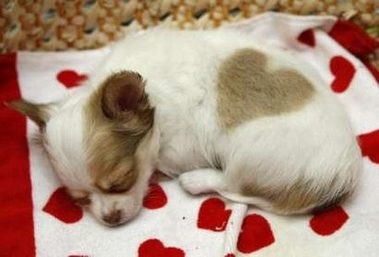 The shop owner Emiko Sakurada said that this is the first time a puppy with these marks has been born out of a 1,000 that she has bred. She also said that she has no plans to sell the puppy. REUTERS/Issei Kato (JAPAN).